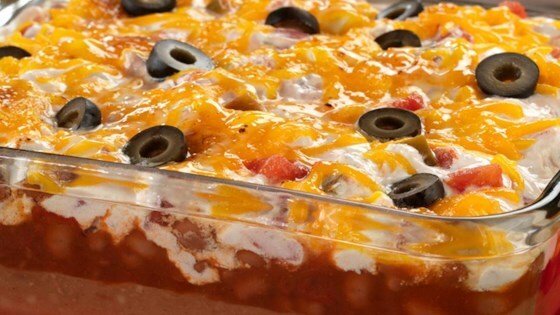 "Be the MVP of the party with this spicy layered dip that delivers BIG TIME on flavor. It's sure to kick up the fiesta." Drain BUSH'S(R) Sriracha Beans through strainer and save sauce and beans, separately. In large bowl, add BUSH'S Cocina Latina(R) Refried Beans and drained sriracha sauce; mix together. Using 9x9 baking dish, first layer combined refried beans and sriracha sauce. Second layer, top with drained BUSH'S(R) Sriracha Beans. In separate bowl, combine sour cream and diced tomatoes with green chilies. Third layer, top beans with the sour cream and tomato mixture. Fourth layer, cover with shredded cheese. Optional: Add desired amount of olives on top of cheese. Cover dish, and bake for 15 minutes. Uncover, and bake until hot and bubbly, about 15 additional minutes. This Spicy Lentil Guacamole is a definite crowd-pleaser.